The community opened this year with 45 homes already sold as of December, and Millstone will have 614 homes upon completion. Goodall Homes expects that the community to be completed in 8-10 years, which puts its estimated time of completion between 2023 at earliest and 2025 at the most conservative. When completed, the 614 homes of the master-planned community will consist of 420 single family detached houses and 194 villas, cottage homes, and town homes aiming to be the “true heart of life in middle Tennessee.” With farm-inspired design and resident-oriented programming, Millstone aims to entice first-time homebuyers, young families, career professionals, and active adults alike to put down roots. At the core of the community will be the amenity area with the Town Center clubhouse as its anchor. Millstone’s amenity area will offer residents a variety of recreation options, including a farm stand, resort-style pool, fitness center, and playground. Much of the amenity area is designed to create a welcoming environment for outdoor living. Incorporating the beauty of the surrounding area, the natural community lake has walking trails that connect to sidewalks throughout the community. Goodall Homes designed The Farm Stand to cater to residents of Millstone and the surrounding areas alike by housing a weekly farmer’s market, providing the area’s residents with fresh produce as well as a place to do commerce for local farmers and vendors. In addition to the farmer’s market, this indoor/outdoor space will also be used as the neighborhood CSA(Community Shared Agriculture) pickup, outdoor workshops, and live music on special occasions. “This will be a great addition for the local residents and serve as a place where students will attend field trips and learn more about agriculture from the University of Tennessee’s master gardeners,” according to Rachael Overall, director of marketing at Goodall Homes. The community builder plans to partner with the University of Tennessee’s Agriculture Extension program to build and maintain the community’s herb garden and courtyard. Whether buying single-family detached or one-level attached cottages, floor plans at Millstone exceed 1,500 square feet and can reach more than 3,800 square feet. Some plans offer the luxury of walk-in pantries, sunrooms, gourmet kitchens, and covered patios. Many, like the Lexington model, have the option of an extra bedroom with full extra bathroom in place of a bonus room, or a second master suite in lieu of a bonus room like the Jefferson model. Exterior options for different plans vary but include front elevations like French Country, Tudor, or Victorian. Some, like the Lexington, also offer different roofline options with a choice between a cottage-style hip and valley roof or a more traditional side-gabled roofline featured in the Homestead option. Not satisfied with simply providing green produce to their community, Goodall Homes has taken several steps to ensure the homes at Millstone exceed industry standards for energy efficiency. “Goodall Homes is committed to helping homeowners take control of energy costs,” said Overall. By partnering with LP® Building Products and using LP® Techshield® as a standard, houses built by Goodall Homes have a lower attic temperature by up to 30 degrees Fahrenheit, thus reducing air conditioning costs. Another feature that helps keep Goodall Homes energy-efficient is the above-standard insulation used. “More than 90 percent of homes are under-insulated. Goodall Homes uses R49 insulation, which is almost four inches more insulation than the industry-standard R38 insulation. More insulation helps save money on energy bills and increases comfort within a home,” said Overall. Other green features such as Energy Star® caulking, low-E windows, and CFL lighting allow Goodall Homes to save homeowners several hundred dollars per year on utility bills and let their customers breathe easier with the knowledge that their home is as good for their wallet as it is for their family. Goodall Homes has been building since 1983, and has been the recipient of national and local awards. The builder has received awards several times in previous years, notably making the Nashville Business Journal’s list of the Top 10 Fastest Growing Companies for the last four consecutive years. They have also been recognized as one of Tennessee’s Top Workplaces from 2012-2015 by The Tennessean and they won the 2016 National Housing Quality Silver award. The highly-decorated builder is now working on exciting new floor plans to introduce in 2016, and will continue to offer one-level living homes. 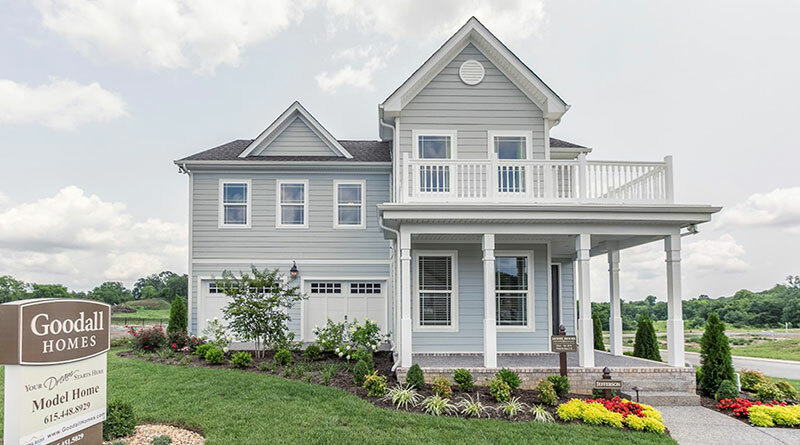 “Goodall Homes is proud to be the only builder in middle Tennessee who specializes in one level living homes in many of our floor plans,” said Overall. The one level living homes, like many of those at Millstone, offer features that make a home easy to live in and visit for all seasons of life, and all within easy reach of vibrant Nashville. Hendersonville is part of Sumner County and the Nashville MSA (Metropolitan Statistical Area), an area that has grown by nearly half a million people since 2000 and supports a vigorously growing job market. In fact, it is one of the fastest growing in the nation; Nashville is already almost as populous as Boston, and is set to surpass Memphis as the most populous city in Tennessee if not this year, then in the next two years. Hendersonville is part of these fast growing communities in Tennessee, and attributes its rapid growth to geographic location and scenic beauty. Millstone is set to provide new residents with the best of both the city and country life has to offer,“ said Overall. “As the Nashville market continues to flourish, we are making plans to expand into additional submarkets within the Nashville MSA.” But in Hendersonville, a city that encompasses 38 square miles of land and 26 square miles of shoreline on Old Hickory Lake, residents might never guess their proximity to a bustling city like Nashville, until they want to.